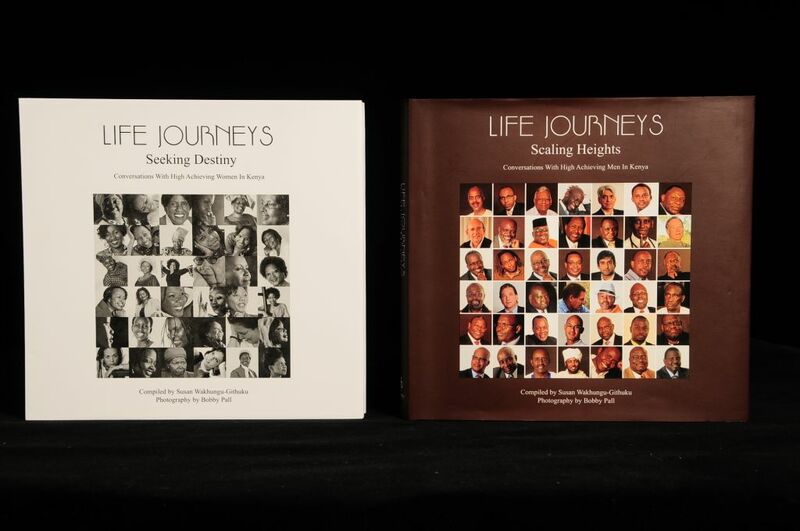 We would like to thank Caroline Mutoko, Jalan'go and the whole Kiss 100 team for their promotion of our newest publication "Life Journeys: Scaling Heights," Conversations With High Achieving Men in Kenya. For those who won the books, congratulations! And we hope that you will be inspired to make a difference in Kenya. This week's "Kenya's Women and Men of the Week" are: Nurse, Writer, and former Member of Parliament, Grace Ogot; Banker, Educationist, and Global CEO Mary Okelo; Scientist and Vice Chancellor Prof. Mabel Imbuga; Chief Executive, Dr. James Mwangi; Broadcast Journalist, Jeff Koinange; and Actor, Teacher, and Playwright, John Sibi-Okumu. Just like Prof. Wangari Maathai, Grace Ogot has done Kenya well. 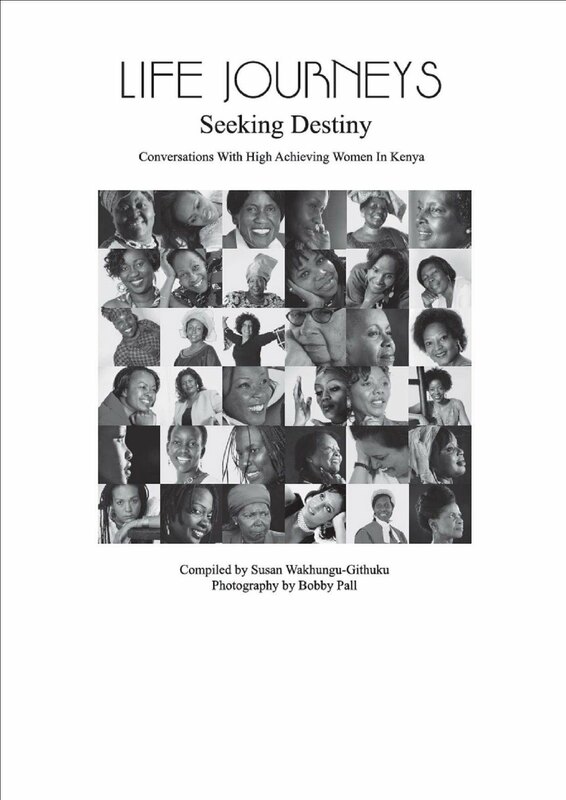 This achiever has published four books, and is among Kenya's first generations of published writers, first black female Kenyan novelist, as well as the first Kenyan woman to have her fiction published by the East African Publishing House. She was Assistant Minister for Culture and Member of Parliament for Gem in 1988, and also a Founder Member of the Writers' Association of Kenya. 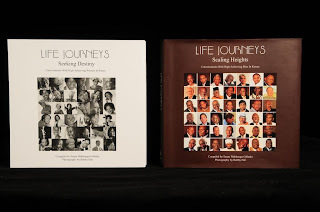 "I was born on 15 May 1930 in the village of Rakombe in Asembo Bay. The village lies on the shores of Lake Victoria, Western Kenya. I remember the beauty of Lake Victoria when I was growing up. There were several rivers and the villagers did not fetch water from the lake unless those dried up. My success has been driven by determination and faith in God. The racism I encountered during my early training days in England as a nurse also propelled me to succeed. I wanted to prove that black people are every bit as good as white people. As a married woman and a mother, my values revolve around helping my husband as his companion and educating our children. I believe it is important for parents of both boys and girls to give their children equal opportunities in education. I taught my children to be good people and to be human. I believe strongly in respect for parents and I also think young people should take the issue of good morals seriously, as this impacts how they live their lives. I also strongly believe that neatness in a person is vital, because it reflects both the inner and outer being. Mary Okelo is the Founder and Proprietor of one of the top performing group of schools in Kenya, the Makini Group of Schools. In 2009, she was awarded in recognition of outstanding efforts in the area of education in Kenya, by the International Committee of the Fellowship of the Least Coin. Ten years prior to that, with even more awards in-between, she was an International Honoree for Who's Who of Professional and Business Women. I went to Nambale Primary School and completed my high school education at Alliance Girls High School. I was among the pioneer group of 13 girls chosen to study for the advanced certificate ('A' levels). My passionate interest in children saw the birth of Makini School in 1978. My late husband and I envisioned a school that would cater for brilliant, yet financially disadvantaged children, who have be denied entry by other schools. Other heroes who inspire me include, generous and forgiving humanitarians like Mother Theresa and Nelson Mandela. Over the last few years, the achievement that has most emphatically captured my mind in the global arena is Obama's election to the White House. Nationally I am most inspired by Professor Wangari Maathai's attainment of the Nobel Peace Prize. She achieved recognition abroad when Kenyan politicians denigrated her efforts to preserve the environment. Her perseverance in spite of both physical and mental abuse is what heroes are made of. Professor Mabel Imbuga has been the Vice Chancellor of Jomo Kenyatta University of Agriculture and Technology since 2008. She is also the Chairperson of African Women in Science and Engineering, and she is a holder of PhD, Msc, MBA, and Bsc, degrees. It is quite important to envision your destiny, but it is infinitely more important to set the pace to get there. We are all full of amazing ideas and big dreams, but we often lack the map to deliver our goals. I have learnt that wherever there is a will, there is always a way. The journey of a thousand miles begins with one small step. Plan it well. Life is ironic. I had studied subjects in classes with few girls and then rose to head an institution that is heavily populated by men. At JKUAT, there are classes that have only one girl amongst twenty or more boys. This is what keeps me going. I mentor these young women to show them that they can succeed, if they want to. I let them know that making the right choices is all that is required. My success has also been backed by my family's support. My husband, Professor Francis Imbuga, has played a major part in my success, mentoring and encouraging me along my way. My children's support has kept me going as well. I am a person who believes that family is worth more than any earthly possessions. Dr. James Mwangi, MBS is the CEO and Managing Director of Equity Bank Limited. Popularly referred to as the banker of bankers he holds four honorary doctorate degrees in recognition of his working in the finance sector as well as his philanthropic endeavours. Mwangi has been honoured twice with Presidential national awards. He is currently the Chairman of Kenya’s Vision 2030 Delivery Board which is charged with the responsibility of ensuring Kenya becomes a middle income country with global high standards of living by the year 2030. He serves on several international bodies as an advisor and sits on the Board of the Africa Leadership Academy in South Africa. Growing up I was humbled by Nelson Mandela. His example of living for a cause influenced me to seek a cause that was larger than me. Life is also about failure and success and there have been moments when I have failed my children, wife, colleagues and even the six and half million customers of Equity Bank. The issue is how quickly you pick up the pieces and soldier on. With humility I always try to explain the circumstances and apologize for the times I have disappointed those around me. I own up to my failures and people have been kind to give me another chance. I have never seen people walk away from Equity. A value system is cardinal and critical to success. Humility, hard work, honesty and integrity have enabled me to connect to just about anyone in society. My word has been my bond. That which I promise I deliver. That ability to stand by your values makes one predictable and dependable and people learn to relate with you. These values are important to me because they have become the basis of my engagement with others. Jeff Koinange has a face and a voice that can be recognized all over the world. The former ‘voice’ of CNN, Koinange is the recipient of a television Emmy Award for his piece on famine in Niger, a Peabody Award for his coverage of Hurricane Katrina, and a Prix Bayeux Award, the most prestigious award for journalism in France. Though internationally successful, Koinange has contributed much to the Kenyan media and his popular K24 TV Program ‘On the Bench’ where he interviews eclectic Kenyans on topical and inspiring issues has become a popular facet of Kenyan life. I worked as a bank clerk for a while after ‘Saints’ and it was there that a colleague mentioned that PanAm, the international airline, was recruiting for cabin crew. I was 19 years old and together with 10,000 other Kenyans I applied for the position. Forty people made the short-list and I was among them. In February, 1986 we headed to the Pan Am Flight Academy in Miami, Florida. My mother is my only true hero she lost her husband and was left with four young children. She could have decided to marry another man or given up and abandoned us but she did not, instead, she put her children first and struggled to give us the best under the circumstances. She taught us the true virtue of hard work and perseverance. My mother is the true hero and a super woman. Journalism is like a pendulum to me, one day a great story will swing your way and you need to be ready when that time comes because the pendulum will swing again and the chance will have gone. More importantly, no story is worth dying for. Period! Yes, you will be ‘The Headline’ for that day but 24 hours later, another story will overtake it and yours will be nothing but a memory. John Sibi-Okumu is variously referred to as a leading actor, journalist, newscaster, Playwright, Newscaster, Columnist, Linguist, Producer, Director, Teacher and Mentor, Once featured in Newsweek Magazine, this quintessential afro-saxon has played over 40 leading roles on stage and on screen. I thought that my first school report was absolutely wonderful as it featured only one or two words for each and every subject. It was either ‘poor’ or ‘very poor’. When my father read it, his response was to suspend me through an open window in the tiny, top floor flat in which we were living at the time in London. He had gone there first, to study, and my mother and I had followed him when I was seven. As I dangled, tearful and distraught, the lesson was delivered to me that no child of his would ever get grades like that again. I took it to heart, because once I got the hang of the English language, I quickly became a prize-winning pupil. Another significant ingredient in my persona is the fact that, just like my father, I am also John Sibi-Okumu. All men have to carry the baggage of being their father’s children but “juniors” more than others. As for my mother, “Never complain!” was a mantra. If any of us children refused some food, it would be served over and over until the culprit finished eating it, however long it took. So, I had two mean but loving parents. Framed on a wall in my study is a favourite quote in French by an unknown author. Literally translated it reads: “Little things are only little things, but to be faithful in little things is a big thing and that is how some people become extraordinary”. To my mind, it’s very simple but also very true."